It’s the mascara that’s beyond belief! benefit's They’re Real! Mascara in Black boasts a jet black formula that lengthens, curls, volumises, lifts and separates lashes for a spectacular “out-to-here” look! The exclusive brush is specially designed to maximise the performance of the long-wearing, glossy formula – revealing lashes you never knew you had! 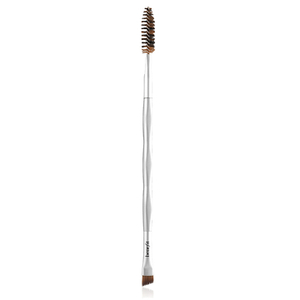 Staggered bristles grab close to the root, boosting length and volume beyond belief. 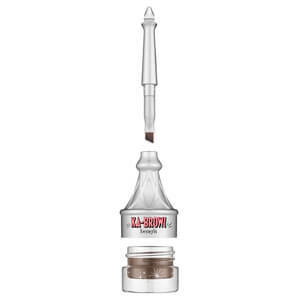 The precision bristles on the custom-domed tip lift, define and curl even your tiniest lashes. The end result...luxurious, silky lashes that won't smudge, clump or dry out. Position wand horizontally and wiggle brush from side to side from base to tip, to achieve maximum volume, length and lift. Hold wand vertically and stroke upward to curl and separate. Layer generously as desired. Water (Aqua), Paraffin, Polybutene, Styrene/Acrylates/Ammonium Methacrylate Copolymer, Beeswax (Cera Alba), Bis-Diglyceryl Polyacyladipate-2, C18-36 Acid Triglyceride, Palmitic Acid, Stearic Acid, Triethanolamine, Vp/Eicosene Copolymer, Acacia Senegal Gum, Hydroxyethylcellulose, Phenoxyethanol, Tetrasodium Edta, Butylene Glycol, Caprylyl Glycol, Tocopheryl Acetate, Sodium Laureth-12 Sulfate, Glycerin, Potassium Sorbate, Sericin, Calcium Chloride, Sodium Hyaluronate, Tilia Tomentosa Bud Extract, Citric Acid, Bht, Sorbic Acid. [+/-: Iron Oxides (Ci 77491, Ci 77492, Ci 77499), Ultramarines (Ci 77007), Chromium Oxide Greens (Ci 77288), Chromium Hydroxide Green (Ci 77289), Titanium Dioxide (Ci 77891)]. N° 05827/N.